Bus from KL to Taman Negara is the only transportation option to travel from KL to Taman Negara located at Kuala Tahan. Bus from KL to Taman Negara has two portions of journey. The first portion is about 3.5 hours bus service from Kuala Lumpur to Kuala Tembeling Jetty and second portion is about 3 hours boat service from Kuala Tembeling Jetty to Taman Negara. Taman Negara is a paradise for nature lovers. Every year, thousands of visitors go to Taman Negara to explore the awe-inspiring nature during the mid-year non-monsoon period. 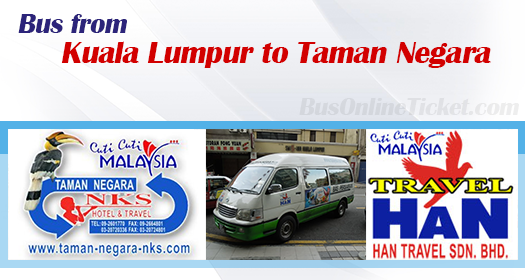 Han Travel and NKS are the only two famous brands serving bus from KL to Taman Negara. They provide daily departures from KL to Taman Negara. Both operators’ departure points are nearby Kuala Lumpur Jalan Sultan at Chinatown. Han Travel departs from Mariamman Building, whereas NKS departs from Hotel Mandarin Pacific, Jalan Sultan. The coaches depart at 8:30am in the morning. The fare for both bus and boat inclusive service is around RM 79.50 to RM 80.00, depending on the operator choice. Usually, passengers will buy return service tickets from KL to Taman Negara and Taman Negara to KL as well. BusOnlineTicket.com accepts offline payment option at 7-Eleven (limited to Klang Valley only) on top of the standard credit card online payment. This is particularly convenient for those who would like to book KL to Taman Negara Bus Ticket online but are without a credit card and Internet banking. Passengers can book KL to Taman Negara Bus Ticket online in BusOnlineTicket.com to secure your seat for bus from KL to Taman Negara first before making payment by cash within 24 hours in any Klang Valley 7-Eleven outlets.